The Rimatrix5 Monitoring solutions include temperature, smoke and vibration sensors, together with sophisticated access control solutions, to provide reliable protection against external influences. Security cockpit for your IT infrastructure. The perfect interaction of physical security concepts and remote management, as embodied in RimatriX5, is able to reduce day-to-day costs significantly. 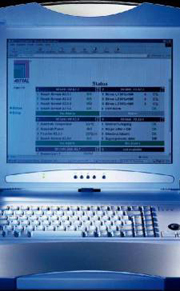 After all, targeted remote maintenance and diagnosis for sensitive parameters extends the service life of active components.Security and remote maintenance – with the new remote management software, RimatriX5 offers full service from a single partner.The temperatures of racks or particular components, for example, can be analyzed and controlled. In the same way, the operating status of the UPS backup can be documented, video surveillance for the rooms and equipment can be monitored, power management can be implemented for individual modules and the operating hours of batteries and fans can be evaluated as a basis for preventive intervention – all from a single software interface. Comprehensive monitoring and control functions – from active PSM modules and intelligent local power distribution to control and analysis for UPS systems and batteries. Active power system analysis returns information on actual power consumption and supply quality. System-wide monitoring and control enable preventive intervention. Everything you need to know, from fan control to the administration of cooling units and high-performance climate control components: The preventive analysis of fan operating hours extends their service life and enhances reliability. In addition to the hardware and software, the RimatriX5 concept also offers comprehensive individual maintenance services. Through the monitoring of all systems, it is possible to guarantee the shortest possible reaction times for service and maintenance work. Access monitoring ensures that authorization rules are observed. At the same time, all relevant events are recorded and extinguisher functions are signaled for the rack in question. The combination of temperature monitoring and access control enables the causes of faults to be recognized more quickly, leaving time to initiate preventive measures. Rack and room surveillance provides a continuous documentation of all events in the data centre. The RimatriX5 configuration software sets new standards for individual project development. Dialogue-based tools for the Rack, Power, Cooling and Security modules enable you – in accordance with the relevant investment decisions and availability – to configure your RimatriX5 structure optimally to suit your particular requirements.